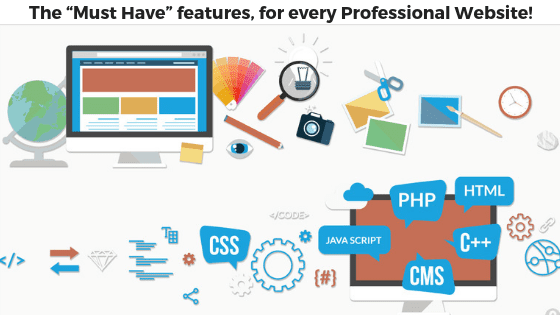 The “Must Have” features, for every Professional Website! So, Let’s look into the finest of “Must have” features for the flourished business developmental approach. Portfolio / Examples of Work. Social Media Links & Social Proof. The first appearance of the website is the best appearance always. And the visual standards of the websites are expected to be ludicrously high these days. So, it’s worth investing in your online business outlook on investing in high-quality images where you can convince your clients. Placing a Quality Images on your website is also a reason for your website ranking and also helps in greater client attraction and lead generation. Hence, investing few bucks on Quality Images is a key feature for a Professional Websites. Here comes the next big investment of our “ Business” and a great place to show off and exhibit your status of the business or the clients you have handled. So, when people, in general, ask “what level of quality can I expect from you”, they simply have to point them to the page to prove the quality of our work. Having a professional portfolio on your webpage will definitely improve your chance in client growth and brand recognition. Probably the most famous names nowadays!! Facebook, Twitter, Pinterest, LinkedIn… there are several social media sites you can use to promote your business. With the greatest number of visitors on these social media .the more fans and followers you gain through social media, the more trust you will harbor with new visitors. Thus a brand Recognition and Trustability automatically increase with an increase in social followers. Blogs!! A great way of not only increase your exposure on attracting new customers through Google searches, but they also help build up a long-term relationship with your visitors. And Surprisingly, you have a high risk of converting a visitor, when If your visitors visit you, again and again, they turn into fans… and your chances of them becoming potential clients increases exponentially. Banners and Images! A great way for client diversion and easy to direct them to the right place you wanted to. Images with a call to action can play a great way for diversion. A detailed note to remember, a highly converting website is one that gets people to the product or solution they are looking for an immediate solution. So, by being the solution for the customers and being clear on what they want and providing them with the solution is the next great way and Pictorial representations play an important role. Nowadays just placing your address at the base of your contact page isn’t good enough. Including a Google Map allows people to not only find you easily but also plot the way they are going to reach you defines. Ultimately it builds trust when people know where you are, and for many businesses, they can’t buy from you if they can’t find you! This technical world has become so handy with smartphones and everything is obtained through one-touch seems possible in every spice of life. Ultimately in 2013, there were a total of 1.4 billion smartphones in use. That’s 1 in every 7 people worldwide! Almost everyone is accessing smartphones and its almost very essential for a business to have it’s mobile -friendly space in online- premises. And that’s how these must have featured are playing their importance in this real-world web development solutions and changing trends every second of it. It’s time now create a plan for how to generate leads for your new business? We are always ready to serve you the needs. Before you are totally messing it up, visit us and get your queries solved.